Complementing the new shelters recently installed at Exeter St Thomas station as part of Citizens’ Rail, the station has now also been fitted with a “Harrington Hump” (pictured above) to improve the station’s accessibility. 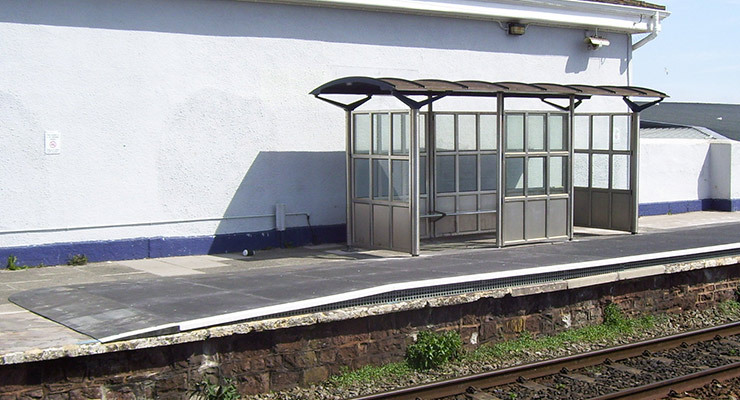 The hump, provided by Network Rail as part of a major roll-out separate from the Citizens’ Rail project, is a simple and cost effective way to reduce the height difference between the platform and the train. Previously, passengers had to take a big step up or down to board or alight the train – causing particular difficulties for people with reduced mobility and families with buggies. Also known as an “Easy access area”, the nickname for the technology derives from Harrington station in Cumbria, the first place where the hump was introduced back in 2008. The Exeter St Thomas hump will be followed by further Citizens’ Rail involvement at the station. New ticket machines are on the way, and the recently formed Friends of Exeter St Thomas group are working with our lead partner the Devon & Cornwall Rail Partnership on a range of exciting potential ideas for the station, including murals, photographic displays and more greenery – all designed to create a welcoming environment and boost usage of the station.